Burgers are the kind of food people fight about. With billions of burgers consumed every year, it’s fairly impossible to get people to agree on which one is the best. And perceptions of what’s greatest in the world of burgers are changing constantly too as the American dish becomes global property. 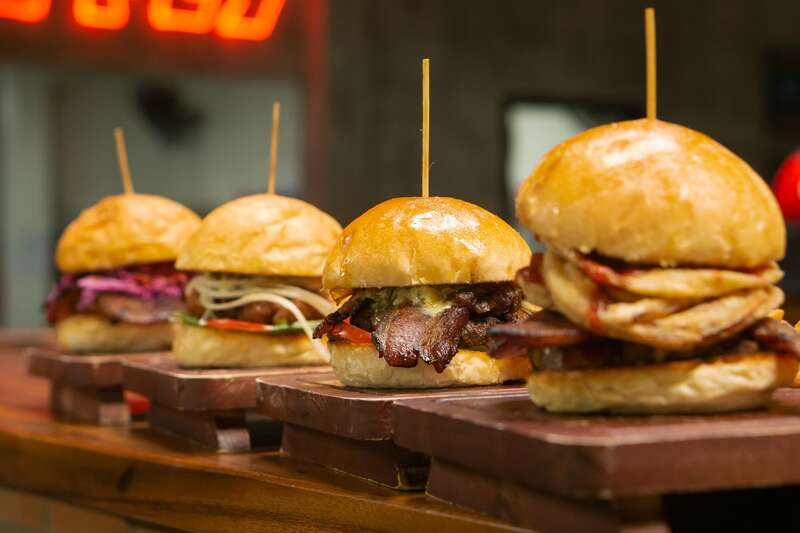 Though not a staple in Vietnamese cuisine, burgers are well-loved throughout Saigon thanks to foreign cultural influences and the city’s cosmopolitan air. Restaurants like Quan Ut Ut are popular names among locals and expats alike. The restaurant chain with locations in District 1, 2 and 7, was “born out of star matter, skittles and a love of BBQ,” according to their owners. Designed with both local and international palates in mind, Quan Ut Ut’s burgers are filled with American spirit and topped off with richly diverse ingredients—components that are fresh, wholesome, and thoughtfully prepared. The restaurant’s cooking has earned them both a huge number of followers and multiple nominations at our Restaurant & Bar Awards 2018. So, with a curious mind (and an empty stomach), we visited Quan Ut Ut’s kitchen to discover the secrets behind four of their specialty burgers. 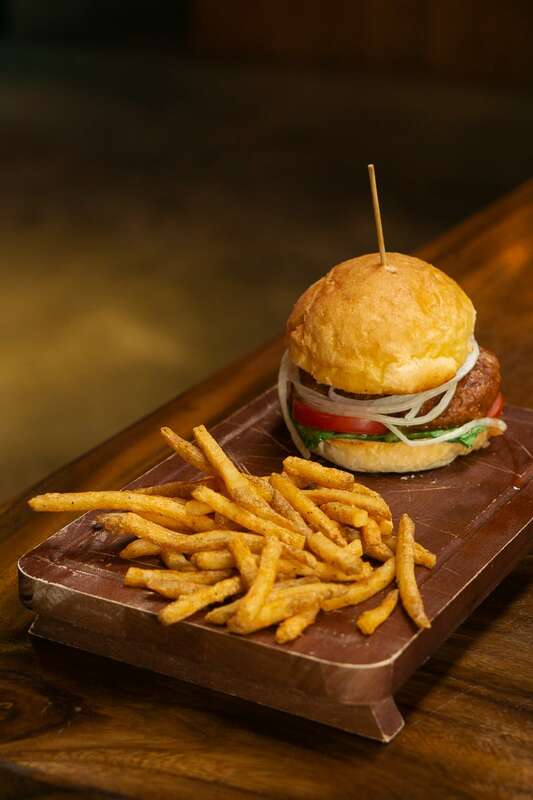 Quan Ut Ut’s signature Red Nailed Chicken Burger is succulent…and spicy. Quan Ut Ut’s Red Nailed Chicken Burger is responsible for growing the chain’s number of loyal diners. Spicy food lovers return to the restaurant longing for one more satisfying bite of this, their signature burger. Step into Quan Ut Ut’s kitchen and you immediately get why this burger has built such a fan base. The carefully selected chicken is marinated with Quan Ut Ut’s special spices, then fried to a golden crisp. Buffalo sauce and jalapeno add extra heat to the burger and the flavors blend perfectly with a softly spicy taste lingering in the back of the throat. A layer of melted blue cheese spread on the top bun adds to the richness of the burger while balancing out the striking spiciness of the chicken. 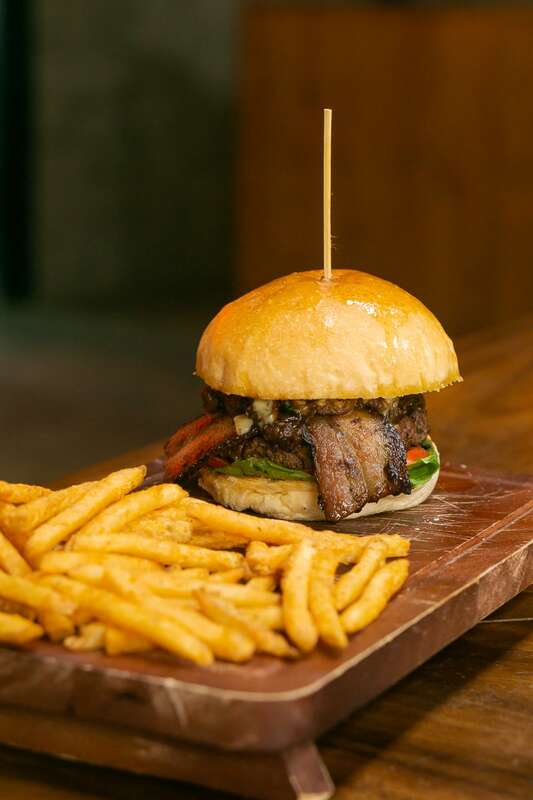 Fancy but unpretentious, the Pigs Will Fly Burger contains crispy bacon on top of tender chopped pork. 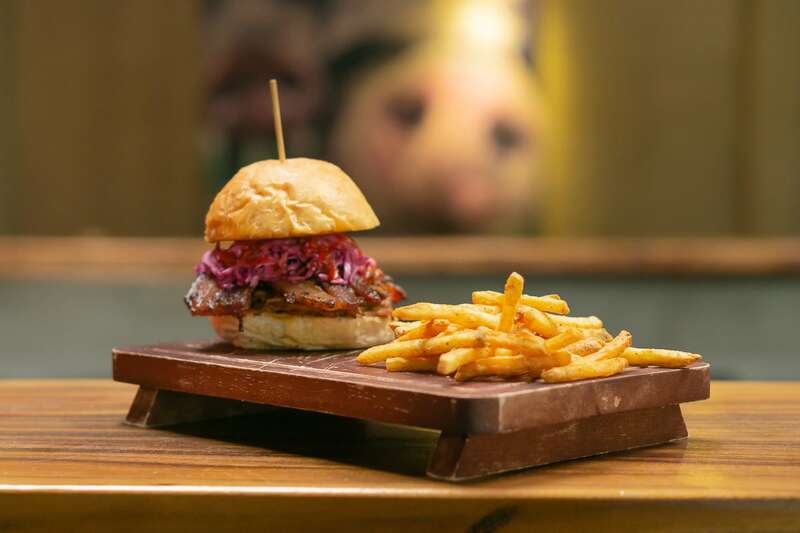 The name tells it all, the meaty Pigs Will Fly Burger is fancy yet unpretentious. 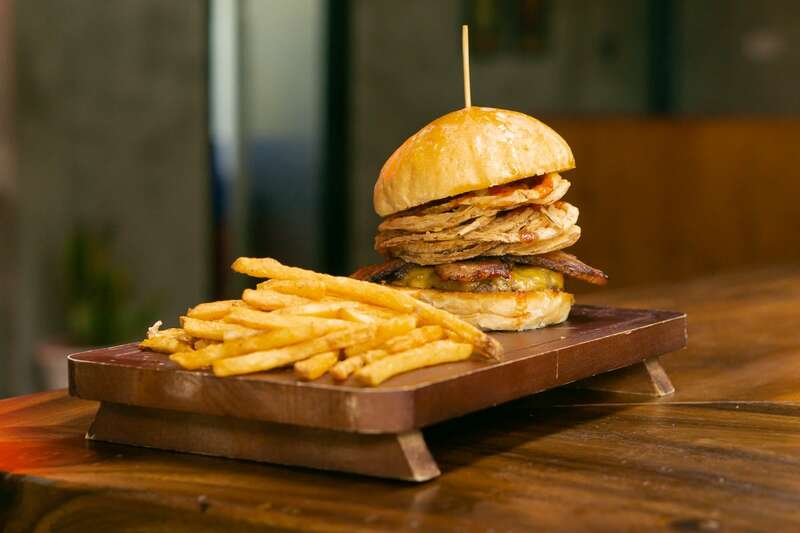 It’s a burger that offers the best of both worlds: crispy bacon on top of tender chopped pork. The salty protein is then balanced out with the refreshing taste of pink slaw. The Sticky Fingers BBQ sauce only, available Quan Ut Ut, binds all the ingredients together into a heavenly combination that simply blew us away. The Bacon Bacon Burger is so bacon-y they named it twice. Bacon to a burger is like beef to a bowl of pho. The Bacon Bacon Burger is so bacon-y they named it twice. But aside from those two smokey pieces of bacon, the burger features high-grade American beef rubbed with Cajun salt and dressed in Quan Ut Ut’s special BBQ sauce. The meaty heap is then topped with crispy onions. Have a bite and immerse yourself in the playful contrasts between crispness and tenderness, saltiness and sweetness. A smattering of American cheese spread rounds out the burger, leaving a soothing creamy aftertaste that compelled us to order one more. Blackened Cajun-style with rich blue cheese—all hail the Black & Blue Burger. Blackened beef and blue cheese are a match made in heaven. Blackening is a classic Cajun cooking technique popularized by Chef Paul Prudhomme. In the process, a black crust of spices is created around the meat which helps to lock its juices inside. In the Black & Blue Burger that’s complimented by a rich and creamy cheese. But there’s something else that keeps us coming back for more—maybe the secret lies in their flavorful caramelized onions. Or Maybe it’s their home-made siracha spicy sauce. Or maybe it’s just everything that, when added together, combines to create a wonderous burger that has to be tasted to be believed.